The University of New Brunswick is pleased to exhibit the first work of art to be featured as part of the university’s Art for New Spaces program. New Brunswick artist Glenn Priestley today unveiled The Hill, a 64- by 90-inch oil on canvas painting that now hangs in the foyer of the C.C. Jones Student Services on the UNB Fredericton campus. Priestley titled the painting The Hill after interviewing a number of students and learning that their most memorable image of the UNB campus, its defining physical characteristic, is the hill upon which it is built. The painting illustrates Sir Howard Douglas Hall on the left, the new Richard J. CURRIE CENTER on the right, and the Saint John River winding its way behind them in the distance. “The students depicted represent various aspects of UNB studies and campus life,” said Priestley. “The central figure conveys creativity and expression. 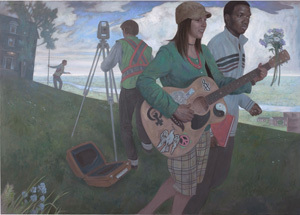 The symbols on her guitar represent various social and political issues, because so often young people work to change the world through their idealism, energy and optimism.” Glenn Priestley was selected from among 30 New Brunswick artists who applied to create the inaugural work of art for the program. He holds a diploma from the Ontario College of Art and Design, and has been showing his work for nearly 30 years in various solo and group exhibitions across Canada and the United States. His paintings are held in numerous public and private collections, including the Beaverbrook Art Gallery, the New Brunswick Art Bank, the Bank of Nova Scotia and the Harvard Business School. He creates portraits, still life and landscapes, using charcoal, oil on canvas and mixed media. He has twice been nominated for a Strathbutler Award and has won two creation grants from the New Brunswick Arts Board in recent years. “The Art for New Spaces Committee received many outstanding proposals for this public art competition and we are pleased that Glenn Priestley’s mural was chosen as the first artwork under this program,” said Bernard Riordon, Director and CEO of the Beaverbrook Art Gallery, and chairman of the Art for New Spaces selection committee. “Glenn is one of New Brunswick’s most accomplished painters and this mural will enrich the Jones Centre, the UNB community and the larger public in New Brunswick.” Art for New Spaces was initiated by UNB President Emeritus John McLaughlin. The program is funded by a bequest from J. William Andrews, a 1952 graduate of UNB’s Faculty of Arts, enabling the university to commission or purchase works from New Brunswick artists for newly constructed or renovated buildings used primarily by students. The purpose is to enrich the aesthetic environment and raise awareness of visual arts among the student body in both Fredericton and Saint John. Established in 1785, UNB is one of the oldest public universities in North America. It’s also one of the top five comprehensive universities in Canada, according to Maclean’s magazine. UNB has more than 12,000 students from more than 100 countries. As the largest research institution in New Brunswick, UNB conducts 80 per cent of the province’s university research. It has more than 3,500 faculty and staff, and an annual operating budget of more than $160 million. UNB’s two main campuses are located in Fredericton and Saint John, N.B. For more information, contact Susan Montague at 506-440-2991, or montague@unb.ca.